Living room is different thing for different people. For someone it is place for entertaining guests and for others a place of relaxation. 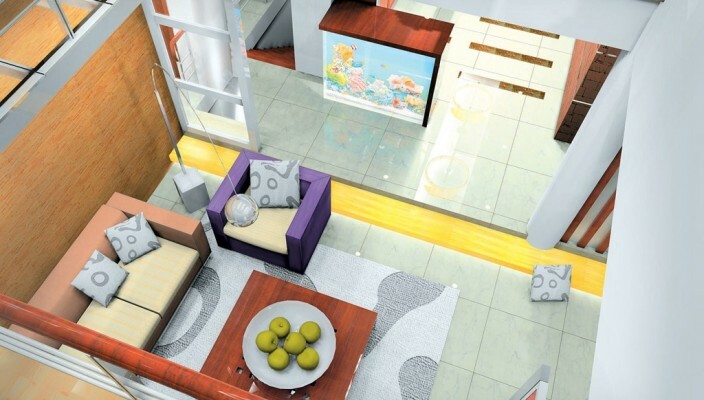 Interior design for living room varies from house to house. Interior design of living room of studio apartment house is completely different from large condominium house. This design is good for a duplex house and would provide feel of comfort. Sofa set area is separated from other area by classy metallic furniture. This design comes with huge work of glass to create sense of space. The entrance of room is provided with stylish entryway bench. The ceiling of room is made from cool colored glass beads to add taste of modernity. This design comprises of work experiment with use of metallic décor furniture. Color combination of sofa set, metallic décor furniture and walls, create eye pleasing atmosphere.